I am a lifelong committed woodworker with a passion to create beautiful useful objects of the highest caliber. A full-time artisan in a one-person business, I build both custom ordered pieces and art furniture. My designs consider aesthetic principles of line, mass, proportion, balance, color and texture; the product is then crafted with notable precision of execution. Whether informed by historical precedent or innovative with current ideas, my furniture is built to last hundreds of years using the best time-tested construction principles. As a feminist, I was excited to be among the earliest women to train in carpentry at the North Bennet Street Industrial School in the late 1970's. I then worked as a cabinetmaker and shop foreman, learning accuracy and efficiency through challenging manual labor. 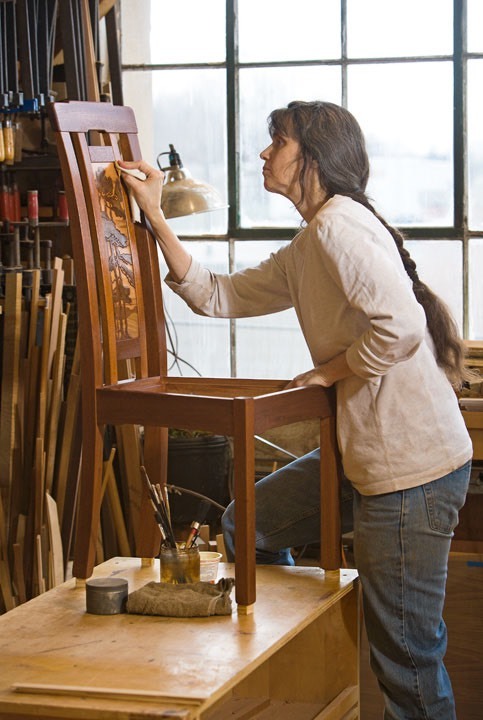 In 1986, I returned to the newly renamed North Bennet Street School to attend its excellent two year furniture making program, pursuing the study and building of 17th through 19th century furniture. Subsequently I began my custom furniture making business, teaching occasionally and later full time, for five years, at North Bennet. I have also taught art/woodworking courses at Wellesley College and at the now defunct Kendall Center for the Arts. My work has been featured in Fine Woodworking magazine, Fine Woodworking Design Books, Woodwork Magazine, Home Furniture, Woodworker's Journal and the Boston Globe; and appeared in exhibitions at the Smithsonian Craft Shows, Fuller Craft Museum, Society for the Arts and Crafts, Wharton Esherick Museum, Concord Museum, Craft Boston, Paradise City Arts Festivals, Providence Fine Furnishings Show and AD20/21: Art and Design of the 20th and 21st Century. My residential clients live throughout greater Boston, MA, also New York City, Mystic CN, Pittsburgh, Grand Rapids, San Francisco, and Seattle. Institutional clients include the Harvard Lampoon, Temple Shir Tikva of Wayland, and Temple Beth El of Belmont. Clients seeking custom furniture require special attention. Together the client and I investigate styles that reflect individual taste and suit home or office. If desired, I provide the client with research on period forms and motifs, gathering photos and ideas from printed materials and museum collections. We discuss multiple design options or possible configurations and review wood specie choices followed by a careful wood selection for color, balance, and form. Possible construction techniques might include hand-cut dovetails, mortise and tenon joinery, complex veneering with solid-core quartered stock, bricking, bent laminations, and sculpted forms. Possible decorative elements include marquetry, inlay, carving, and turnings. Recent work reflects my increased interest in late 19th century and early 20th century design: Gothic Revival, Aesthetic Movement, Arts and Crafts, Art Nouveau and Art Deco. Various commissions have included inlays of pearl, metal, and/or semi-precious stone as well as marquetry and bas-relief marquetry. 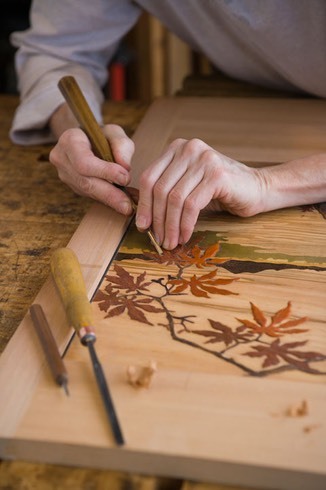 Marquetry (the cutting and assemblage of veneers into pictures or design abstractions) uses the entire palette of earthy wood colors, a wide range of figure (curl, burl, mottle, crotch, ribbon-stripe…) and sand-shading, a process of delicately heating and singeing the wood to create a three-dimensional effect. The resulting pictures can be delightful and unique. I find marquetry, because it so engages the color and texture of wood, to be one of the most satisfying methods of embellishing a work. If thicker shop-cut veneer is used, the marquetry can be carved, hence bas-relief marquetry, a process I have uniquely developed. Another technique that I particularly enjoy is chip-carving: the cutting of shallow reverse three sided pyramids into the wood surface creating a textural pattern that works well to frame a marquetry panel. Below: "Bas-relief marquetry" in the process of being carved.